This is the first topside hull layer that spans the boat. 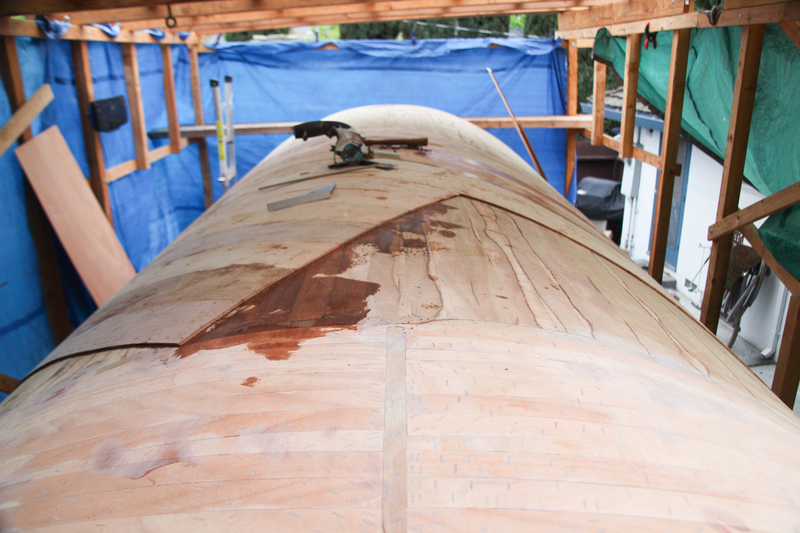 To make the hull strong, the stripping has to run across the previous stripping/planking layer as much as possible. In addition, I am using much wider strips (6 inch) because the curve is a very straightforward and manageable corkscrew for most of midship. Wider planks generally equals more strength and less trouble with cutting and epoxy*. When your strips start to hit the hemisphere shape fore and aft, the curve is no longer straightforward. To deal with the difficulty with bending around a compound curve I will change from 6 inch strips and start using 1 1/2″ strips. The angle you see on the top, in the foreground is where the 6 inch strips stop. Splitting the stripping like this allows me to run many more 6 inch strips on one side of the boat where the curve is still simple, while also enabling me to run thinner strips where it is beneficial. For the next layer, the 30 degree angle for the stripping and will flip-flop the areas for wide strips and small strips. I think it is Beautiful. What I love is that each stage of the build presents new problems that require new solutions. We have talked many times about the joy of problem solving in wood working. That is what keeps me interested, and, apparently, you too. I work for Discovery Channel Canada. This sounds like a great project. You can reach me via email- would love to chat!